EDDIE Hearn says he will be targeting a unification clash for Ryan Burnett in October or November back at the SSE Arena following the North Belfast man’s thrilling title win on Saturday. The IBF is almost certain to mandate Burnett to defend against number one challenger, Emmanuel Rodriguez next unless he can fight to unify the bantamweight division and Hearn believes he can set-up a meeting with the WBA champion, Zhanat Zhakiyanov – who Burnett has sparred when with former trainer, Ricky Hatton ­- instead. It is quite astonishing that the North Belfast man could potentially hold two world title belts after what would be just 18 fights, but Hearn believes this is the road to travel and is confident he can deliver. “He has got a mandatory because Lee Haskins had to ask for an exception to fight Ryan Burnett,” explained the Matchroom boss. “The mandatory is a guy called Emmanuel Rodriguez from Puerto Rico who is very good. We can’t ask for an exception because that was an exception (tonight) so the only thing we can do is have a unification. That’s what we will be trying to do. 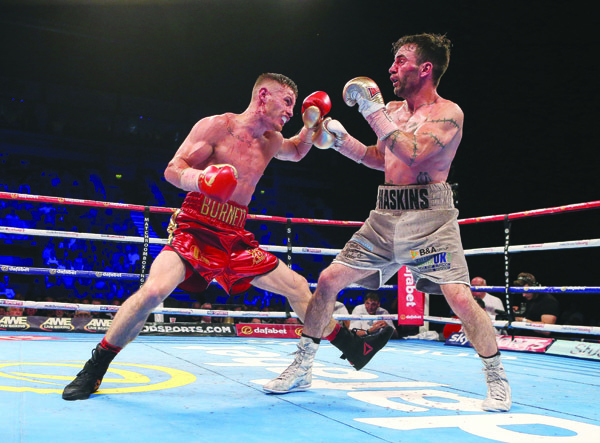 Like most, Hearn was stunned at the scorecard of judge, Clark Sammartino on Saturday night after the American judge scored the fight 118-108 to Lee Haskins who was clearly well beaten, but he shed light on the situation after and said it was a case of mistaken identity. “He asked our photographer after one or two rounds ‘which one is Lee Haskins?’,” revealed Hearn. “Lawrence (Lustig) said ‘in the red corner’. I think he asked him a couple of times and I think he thought ‘in the red shorts’. “It’s frightening your future can be put in the hands of someone like that. “I don’t want to disrespectful because he’s an old gentleman and I’m sure he has judged many fights, but that could have gone horribly wrong. “We could have had to go and recall scorecards and ask him if he put it in the wrong box. He obviously did because he scored two 10-8 rounds to Haskins. It was a gamble for Hearn to thrust Burnett into a top of the bill world title fight in his home town given the North Belfast man had boxed just three of his 16 previous pro contests on home soil and didn’t enjoy the same high profile and adulation of others, but the risk certainly paid off as a very healthy crowd turned up for what was a magical night. Burnett’s profile will certainly now sky rocket and it is a no-brainer to have him based back here regularly given his performance and status as world champion. “He hasn’t been built here,” Hearn acknowledged. “He has had to come into a world title headline. I was worried when he was walking down the corridor and even in the ring, he was really quiet and freakishly calm. I was thinking that he might have frozen, but he was just freakishly calm. Burnett had come in for criticism in some quarters prior to Saturday due to the manner of some of his previous victories, but he certainly turned on the style to claim the world title and Hearn expects now the public will see the vastly talented 25 year-old operating at full speed from here on in against other world class opponents. “When I signed Ryan Burnett, Adam (Booth) said ‘this guy is freakishly good’, but we didn’t see it really. We saw good, solid performances, but that was frustrating. We didn’t want the handbrake on, we wanted him to entertain,” he admitted. “You will see how good he is against the likes of Zhakiyanov and Rodriguez. He will move up to super-bantamweight, not yet, but in time. “He still has a lot of developing to do and confidence as well. He hasn’t had the people behind him driving him like the fans making him feel like a superstar.